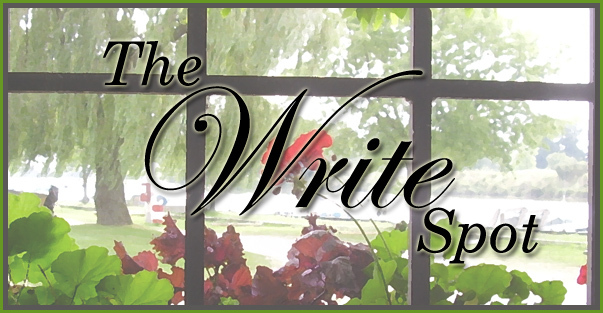 Welcome to the fifth edition of The Write Spot, a bi-weekly author series spotlighting the many and varied places where writers write. This week, I'm delighted to welcome award-winning author Karen McCullough. Karen tells me she's been writing for close to thirty years but her wide-ranging imagination won't let her stick to one genre for her storytelling. As a result, she’s the author of more than a dozen published novels and novellas, which span the mystery, fantasy, paranormal, and romantic suspense genres. Karen was born in New York and spent her early years in the Long Island suburbs before moving to the Boston area with her family. She travelled south to attend Duke University in Durham, North Carolina, where she met her husband and graduated with a degree in Spanish and Anthropology. 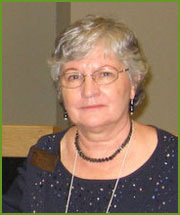 She worked as a social worker, computer programmer, and editor with an international trade publishing company before finding her bliss writing fiction. Karen lives in Greensboro, North Carolina and has three children and four wonderful grandchildren. Looks like a perfect spot for writerly focus, Karen. I'm intrigued by your big blue balance ball. I've often thought of getting one but, knowing me, I'd be constantly tipping over! 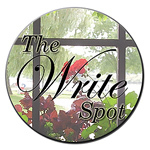 Please tell us what makes this the Write Spot for you. 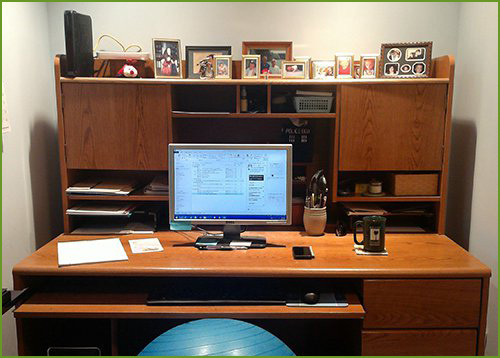 Ten years ago, when we did a major renovation of our home, we adapted an old attached garage to be my office, and a recessed corner (which our main builder referred to as 'the nooch') was the obvious place for my computer desk. With pictures of family members looking down and a few special animals for inspiration, this area just works for me. I do have a regular chair, but most of the time I use the balance ball instead. It gives me a bit of extra exercise, particularly for strengthening my core, and it seems to help keep my bad knees from locking up quite as much. I had to try a couple of balls to find one that was the exact right height, but it really works well as a seat. I thought I'd be tipping over all the time, too, but it doesn't happen. However, it does tend to roll away whenever I stand up! Other than your computer or laptop, what's the one thing you couldn't be without in your 'nooch' / Write Spot? A cup of coffee. I run on coffee. I hear you. Nothing gets done without the coffee! What are you working on now? I've recently turned in the sequel to A Gift for Murder, in the Market Center Mysteries series, tentatively titled Wired for Murder, and another romantic suspense to Kensington/Lyrical, so right now I'm doing a novella in the Market Center Mysteries series. 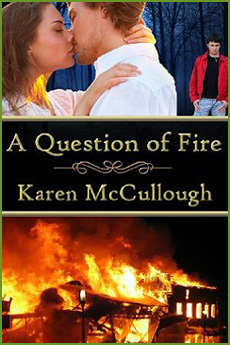 Karen's romantic suspense, A Question of Fire, is available now. Get it here. When Catherine Bennett agrees to attend an important party as a favor for her boss, she knows she won't enjoy it, but she doesn't expect to end up holding a dying man in her arms and becoming the recipient of his last message. Bobby Stark has evidence that will prove his younger brother has been framed for arson and murder. He wants that evidence to get to his brother's lawyer, and he tries to tell Cathy where he's hidden it. Unfortunately, he can only manage to give her a cryptic piece of the location before he dies. Read a chapter excerpt and access additional purchase links for A Question of Fire on Karen's web site. Karen, I love your little nook with all the family pictures. Great inspiration. A QUESTION OF FIRE sounds like a great book. Good luck with it! Karen, I, too, am impressed with your balance ball. I tried one once but just couldn't grasp the hang of it. A Question of Fire definitely looks like a book to put on my "to read" list. Good luck with it. Karen, I love getting to know you a little better through this glimpse at the nook where your books come alive. Your writing nook looks very cozy - a perfect balance of having everything you need close by and no clutter. Cheryl, it's so nice to see these writing spaces. Thanks for bringing them to us. Thank you all for visiting and thank you, Karen, for sharing your writing space with us. I'm having great fun with this project, getting to know so many talented authors and see where they work. Cheryl -- I'm sorry I'm so late posting this! I had a family semi-emergency and had to go out of town unexpectedly. I appreciate your letting me visit and share my writing space. I expected to have trouble using the balance ball, but it was surprisingly easy to adapt to it. The key really is finding one that's the right size I thought the smallest one would be my best bet since I'm pretty short (5'2") but in fact the medium size is the perfect height for me to use at my desk. Sorry to hear that, Karen. I hope all is well again. I may give one of those balance balls a try myself. Thanks again for visiting!